We read the paper by Lim et al. 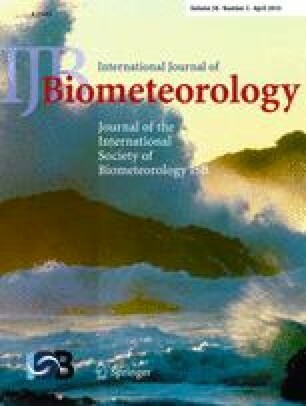 (2012) with great interest because it highlighted the very important issue that deaths among the elderly are associated with diurnal temperature range (DTR)—a meteorological term defined as the difference between daily maximum and minimum temperature within 1 day—in six Korean cities. Respiratory tract infection (RTI) is the most common acute disease reported for the elderly, leading to considerable fatality (Mourtzoukou and Falagas 2007) and ranking first among causes of disability adjusted life-years (DALYs) lost in developing countries (WHO 2009). However, no survey has yet been published demonstrating the relationship between DTR and RTI among the elderly. In an attempt to fill this gap, we would like to share our findings from a recent investigation in Guangzhou—the largest trading city in southern China.